Employment King.co.uk is working with us to give away this wonderful free gift for Life Coaches and people wanting to coach themselves. No Catch, No Sign Up, No Registration!! If you are looking to improver your coaching skills, if your looking for the latest coaching techniques or if you want extra life coaching resources then all you have to do is click this link below for an Instant Download. 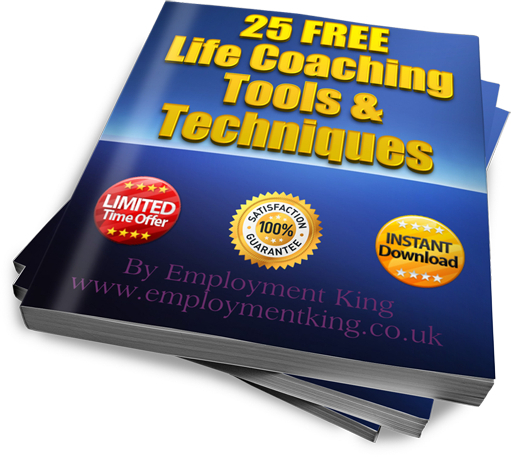 We hope you enjoy these FREE 25 Life Coaching Tools ad Techniques and we would also like to thank the team at Employment King for sharing this gift. Previous postDo Inspirational Quotes Have Any Affect On Your Self Esteem? Next postDo Manchester Residents Have a Phobia of Cheese? What is the name of your Life Coach course and what is the cost of the course?